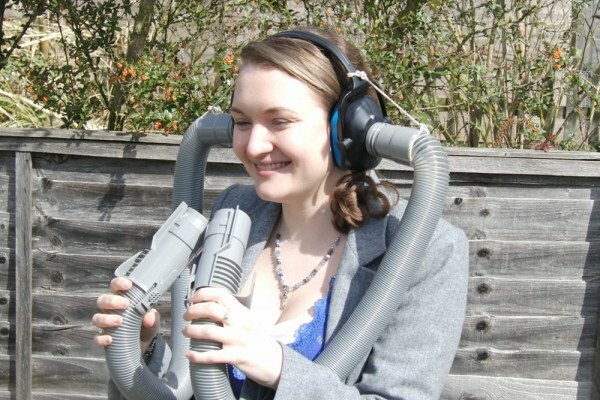 It consists of a pair of ear defenders with stretchable vacuum cleaner tubes connected to each earpiece. You get someone to talk into both of the other ends of the tubes and then stretch one or the other. You should find that if you stretch the right hand tube it sounds like the noise is coming from the left and vice versa. This works because it confuses one of the major ways you work out where sounds are coming from. If a sound is coming from the left it will reach your left ear before the right, and vice versa. If it is coming from straight ahead it will reach both ears at the same time. If it is coming from straight ahead or behind it will reach both at the same time. This means that if you wear the ear defenders and both tubes are the same length it sounds like the sounds are coming from in front of you, but if you stretch the right hand tube the sound takes longer to get to your right ear, so it sounds like it is coming from the left. If both tubes are the same length the sound reaches both ears at the same time. if you stretch the right hand tube it takes longer to get to your right ear, so it sounds like it is coming from the left. This system will only tell you which side of your head sounds are coming from, not whether it is in front or behind, which is why it is sometimes very hard to work out is coming from in front of you or behind you. Next The Nine Dot Challenge!